On Dec 1, I landed in Amman, Jordan to facilitate the National Institute for Training of Women Trainers in Information and Communication Technology for Social Change, convened by Women’s Learning Partnership (WLP) and Sisterhood Is Global Institute-Jordan (SIGI-J). 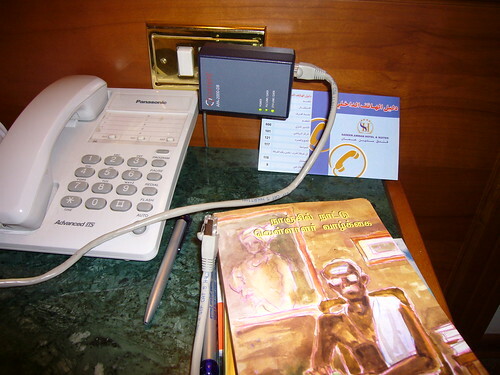 SIGI-J had booked a room in Hotel Sadeen Amman for the duration of the training. I purchased an internet connectivity card at the hotel and got this cool plug-and-play box. The plug-and-play box has power input on one end and ethernet cable on the other. I could just plug it into any electricity outlet at the hotel and enjoy high-speed internet connectivity. A speed test on cnet’s bandwidth meter clocked 438.1 kbps (what can I say, I am a geek :)).